OAKLAND, California (July 24, 2009)–The City of Oakland announced headliners and featured performers for this year’s 9th Annual Art & Soul Oakland Festival. Thanks to guaranteed stellar lineups, abundant parking, easy BART access and the bargain price of just $10 per day, Art & Soul Oakland has been named the Bay Area’s “best annual cultural event” by Oakland Magazine and Best Festival by East Bay Express. The SF Weekly added, “Art & Soul is dialed in to practically everything that makes Oakland great.” Held in beautiful, re-energized downtown Oakland three weeks earlier on Saturday August 15, and Sunday, August 16, 2009, the festival delivers four concert stages offering simultaneous talent and diversity featuring an eclectic all-star lineup of 40 national recording artists and hot Bay Area bands sure to please every musical taste. While stage lineups are still being finalized, the acts continue the diverse and wonderful variety that has made Art & Soul the region’s most popular music festival. Saturday is anchored by headliner and multiple Grammy winner Shawn Colvin on the Art & Soul Main Stage (in association with KFOG 104.5 FM/97.7 FM) Colvin’s tender, crystal clear voice sings of poignantly vivid images of relationships and life with great insight. Her performances are all at once astonishing and haunting, provocative and seductive. Sharing the stage are the BoDeans, the danceable, lean and scrappy folk/rock band once named best new band by Rolling Stone magazine. Now, 20 years later, their romantic sensibility and passionate harmonies linked to simple but potent guitar based rock and roll still excite. The new Yoshi’s Jazz Stage is newsworthy in and of itself. The lineup was selected through collaboration with the booking agents for both the Oakland and San Francisco Yoshi’s Jazz Club. Headlining on Saturday are the funky brass sounds of Mo’Fone. Jazz Weekly says Mo’Fone, “Snaps and crackles like James Brown’s Famous Flames with a New Orleans second line.” Jazziz sums it up with, “Mo’Fone brings the grease.” The Oakland Public Conservatory of Music under the direction of famed jazz trombonist Angela Wellman opens the day at 12:30 P.M. The smoky saxophone sound of Dayna Stevens follows and then the cool Latin/Soul of Sepia leads into the roaring Mo’Fone close. Headlining the Plaza Stage’s Local Voices programming on Saturday is world renowned Fado singer Ramana Vieira. Called “A rising star in World Music,” by the San Francisco Examiner, Ramana has solidified her place as an artist who understands the tradition of Fado singing, but constantly combines new musical textures and original compositions. Berkeley-based Indie Rock singer/songwriter Jesse Strickland (aka Dear Indugu) brings an intensely passionate presence and personal lyrics to open the segment, followed by the Afro-Venezuelan sounds of Oakland ‘s Rosa los Santos . Abby and the Pipsqueaks and Jump Street open the Plaza Stage with humorous children’s music and family entertainment. In addition, Saturday features the wildly popular Gospel Stage with Edwin Hawkins and Bishop Walter L. Hawkins and the Community in Praise Mass Choir. An entire afternoon of uplifting, roof-raising Gospel music will abound including Terence Kelly & Oakland Interfaith Gospel Choir, the Love Center Choir, Kevin Moore, Carl Wheeler & Men of Endurance and Derrick Hall & Company. The indomitable Will Downing tops Sunday’s Main Stage line-up (in association with KBLX 102.9 FM) In late 2006, Downing was diagnosed with polymyositis, a disorder causing weakness in joints and muscles. As a result, Downing recorded the majority of his vocals for 2008’s After Tonight from a wheelchair. Buoyed by fan support, Downing continued to struggle against the disease and released the soulful Classique in 2009. His gorgeous, smooth, deeply personal delivery connects emotionally with the listener, his song choices are excellent, and his arrangements are extremely sophisticated. Also on the Main Stage is blue-eyed soul singer Bobby Caldwell. Best known for his What You Won’t Do for Love, Caldwell provides a genuine mix of R&B and jazz signatures with his bittersweet, buttery vocal tones that make him equally adept at his own originals or classic standards. Expect people to be up and dancing at the Latin Stage on Sunday. Chino Espinoza y Los Dueños Del Son headline. Their high energy, infectious music is perfect for the dance club and has made them the most popular Salsa orchestra on the West Coast. Building up to Chino’s show we have Ba-Tu-Ke with their heady mixture of Cumbia, Son, Merengue and Samba mixed with Brazilian and African percussion and sweet vocal harmonies. Sandy Perez y Su Lade offer Afro-Cuban folkloric music with a strong percussion base, and Fito Reinoso returns to Art & Soul Oakland with his stunning Salsa Cubana. On Sunday, the Plaza Stage is dedicated to World Dance. The stage opens highlighting the youth and adult classes of Bay Area dance studios. That will be followed by a steady stream of Bay Area hip-hop dance crews. The highlight of the afternoon is sure to be Tribute to Michael Jackson presented by Bay Area hip-hop dance companies and featuring dancers from the hit TV series So You Think You Can Dance and America’s Best Dance Crew. Art & Soul Oakland has great music but that’s not all. A family paradise, the festival boasts the largest Family Fun Zone of any festival in the Bay Area, complete with kiddie rides, children’s entertainment and free festival admission for ages 12 and under. The ever-expanding Family Fun Zone is jam-packed with interactive activities for children of all ages, as well as kid-friendly carnival games, inflatable bouncers and hands-on activities to create their own art to take home. Every year, Art & Soul Oakland features hundreds of artisan and vendor booths as well as a mouth-watering array of food reflecting the rich cultural diversity found in Oakland–the most diverse city in America. The 9th Annual Art & Soul Oakland takes place in downtown Oakland on Saturday, August 15 and Sunday, August 16, 2009 from Noon-6 PM. The festival is centered in Frank Ogawa Plaza and City Center , encompassing 10 strollable city blocks. Admission is $10.00 per day at the door; $5 for seniors, disabled and youth 13 to 17, with 12 and under free. For more information on the 9th Annual Art & Soul Oakland , visit www.ArtandSoulOakland.com or call (510) 444-CITY. 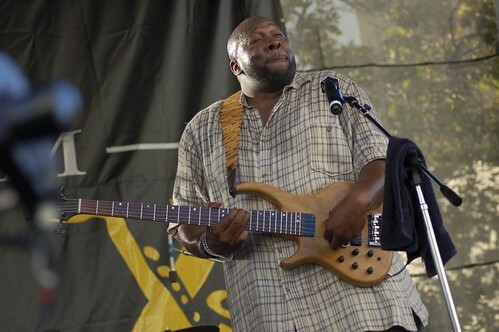 Photo of Wayman Tisdale at Art & Soul Oakland 2006 by James Knox. RIP Wayman. This entry was posted on Friday, July 31st, 2009 at 5:07 pm. It is filed under Art & Soul Oakland, Community, Music News/Info, Oakland. You can follow any responses to this entry through the RSS 2.0 feed.